Tater tot hotdish is one of my favorite comfort foods and fortunately simple to make. Press the uncooked ground beef into a 9×9 baking dish. (Double the recipe if you use a 9×13 dish.) Dice the onion and drain the green beans, adding both on top. Spoon out and spread the cream of chicken soup. Add a dash of salt, pepper, and Lawry’s seasoning salt. 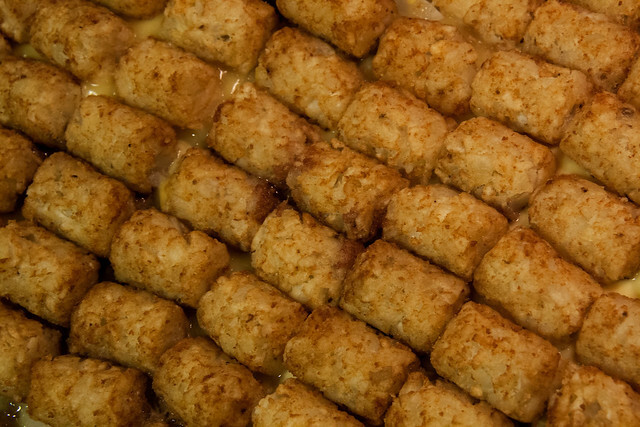 Finally, top with frozen tater tots, neatly lined in rows. Bake at 350 for 1 hour. Broil for the final couple minutes for extra crispy tots.